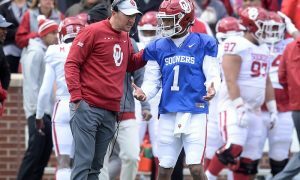 With spring football right around the corner, every Big 12 team will hit the field with some new faces heading into the 2019 season. While we I don’t want to focus too much on the past, let’s face reality here. All these guys will be very tough to replace for each team. Obviously, each team will have more than one player that may be irreplaceable, but I will choose one from each team to make things a little more interesting. 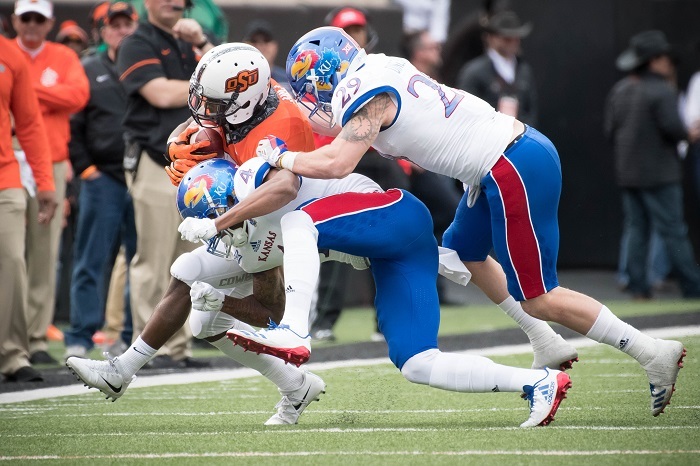 I could have easily made a case for Big 12 defensive player of the year David Long, but Will Grier was much too important for me to leave off here. He led the Big 12 in passing yards per game (351.3) and threw for 37 touchdown passes in just 11 games. 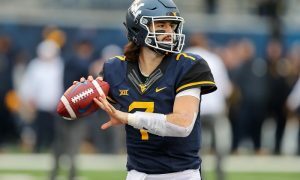 Let’s face it, without Will Grier at the helm, West Virginia probably wouldn’t have been in contention for a Big 12 title last season. Whether you agree or disagree with that there is no argument when I say that Will Grier will be extremely tough to replace in Morgantown because he is likely one of the best quarterbacks in Mountaineer history. In you have been following my write ups here at Heartland College Sports, you know that when I refer to David Montgomery, I go by his real name which is David “The Machine” Montgomery. Why? Because all this guy does is break tackles and make plays. He can create and make people miss like very few backs can do at an elite level. I know WR Hakeem Butler was fantastic this season, but Montgomery was second in the Big 12 in rushing and truly was the heartbeat of the Iowa State offense last season. I still think that over the last two seasons, David Montgomery was the best running back in the Big 12. This man was a three time all first team Big 12 selection and a three-year captain for the Wildcats. Not only was Dalton a great player but he may have been an even better leader. To me, Dalton was the best offensive lineman in the conference last year and offensive lineman don’t just grow on trees. This is a position that requires a little more patience when you compare it to other positions on the field because of the development involved. Again, great player and an even better leader. 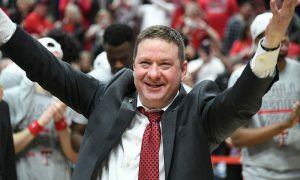 I know that Kansas State will miss him in the huddle next season. It doesn’t take a genius to understand just how bad Kansas has been over the last few years. Very little winning which will make most people watch anything else besides Kansas football. However, if you did see a few Kansas games over the last two seasons, you likely saw a trio of defensive players that were fantastic. Sure, DT Daniel Wise is a great player but what Joe brought to this defense was leadership. While he didn’t have nearly as many tackles for loss this past season compared to 2017, he did manage to lead the Big 12 in total tackles which should count for something. He was a first team all-Big 12 selection in 2018 and Kansas fans should be thankful for a player like Joe and everything he has done for the program. I would have never thought before last season that Jalen Hurd would lead the Bears in receiving yards ahead of someone like Denzel Mims, but I was wrong to think that. Jalen was the most consistent wide out last season for Baylor and while he only had four touchdown catches last season, he also had three rushing touchdowns as well. When the ball was in Jalen’s hands, he made plays. Not bad for a former running back right? I know LB Dakota Allen was a great player for Texas Tech but since he was banged up for most of last season, I couldn’t put him over Antoine Wesley after what he was able to do last year. Antoine caught 88 passes for 1,410 yards and 9 scores last season which was second in the big 12 (receiving yards) and third overall in the entire country. Texas Tech has a history of producing great wide outs, but I am not sure if anyone will have a season like Antoine just had anytime soon. Maybe I am wrong, but Antoine was simply on another level last year. DE L.J. Collier had a monster season last year, but Ben Banogu is darn near irreplaceable for any team and that includes TCU. While his sack numbers were down from 2017, Ben still had an incredible year with 8.5 sacks and 18 tackles for loss. His quick burst off the edge gave offensive lineman fits and offensive coordinators nightmares over the last two years. Ben was a guy who offenses had to pay attention to constantly so they could provide an extra body to help keep him off their quarterback. Pass rushers are premium in this pass happy league and Ben was one of the best, if not the best pass rusher over the last two years. Statistically, Justice had his worst season in 2018 when you compare it to his freshman and sophomore campaign but if he would have played in all 13 games, he would have easily been over the 1,000-yard mark once again. Jordan Brailford could have been here, but Justice was probably one of the best running backs in Oklahoma State history. His ability to cut and his speed put him in that elite category much like someone I mentioned earlier at the running back position. I know the Cowboys have some solid guys coming back at running back but Justice Hill is a once in a decade type running back in my opinion for this program. 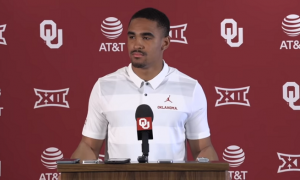 You can make the argument saying that Oklahoma replaced one Heisman winner at quarterback last year and why can’t they do it again in 2019? 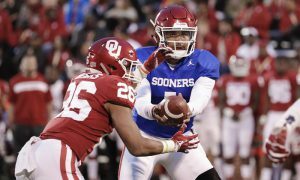 Maybe Jalen Hurts is that guy, but I seriously doubt that he will be better than we what just witnessed from Kyler Murray this past season. 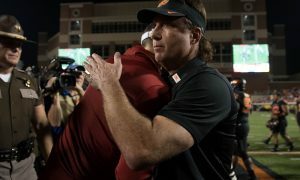 HE WON THE FREAKING HEISMAN TROPHY FOR CRYING OUT LOUD. Heisman winners don’t just grow on trees and Kyler is a very rare player that comes around maybe once in a lifetime most likely. From his name alone you can’t replace him but how about his play on the field? 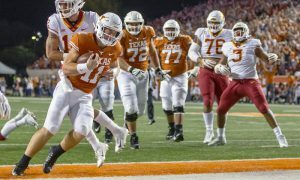 He brought life to the Texas wide receiver group last season and at 6’4-225 pounds, he was a match up nightmare against almost anyone trying to cover him. Lil’Jordan was a physical freak that you don’t see very often, and he had the most receiving yards in a single season for Texas since Quan Cosby back in 2008. Yeah, its been awhile since we have seen a wide out have a season like Lil’Jordan just did at Texas.